Aquatic invasive species (AIS) are plants or animals not indigenous to the area that arrive at a lake and become a dominant component of the aquatic community, negatively impacting other species or uses of the lake causing ecological and/or economic damage when it becomes established. AIS are a form of biological pollution, primarily spread by human recreational activities through transport of watercraft and related equipment from one infected waterbody to an uninfected waterbody. Engaging with recreational boaters and anglers to encourage preventative behaviors is crucial for managing the spread of AIS which are extremely difficult if not impossible to contain, control or eradicate. If caught early eradication efforts may be possible. Prevention, a rapid response and containment is key! Eurasian watermilfoil (EWM) is an aquatic invasive plant known for its rapid growth and reproduction and ability to spread beyond control. The plant’s aggressive growth of dense weed beds is a signiﬁcant threat to the water quality, ecosystems, health and preservation of all our lakes and ponds. 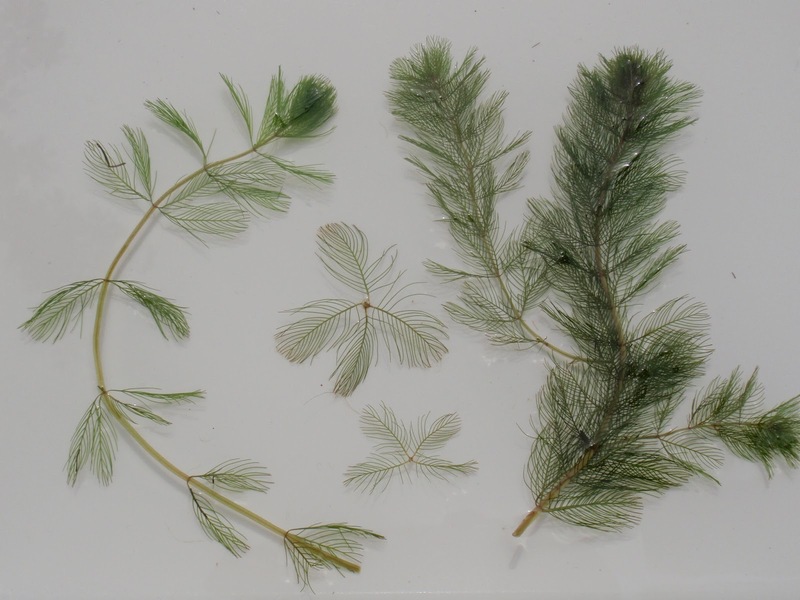 Eurasian watermilfoil (Myriophyllum spicatum L.) is a non-native invasive submerged aquatic perennial plant that propagates through root division, stem fragmentation, and seeds. 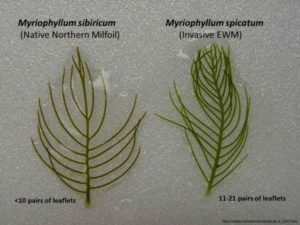 Though commonly referred to as “Milfoil” the acronym for Eurasian watermilfoil ‘EWM’ is preferred to distinguish it between several species within the watermilfoil ‘family’ that look very similar to each other. 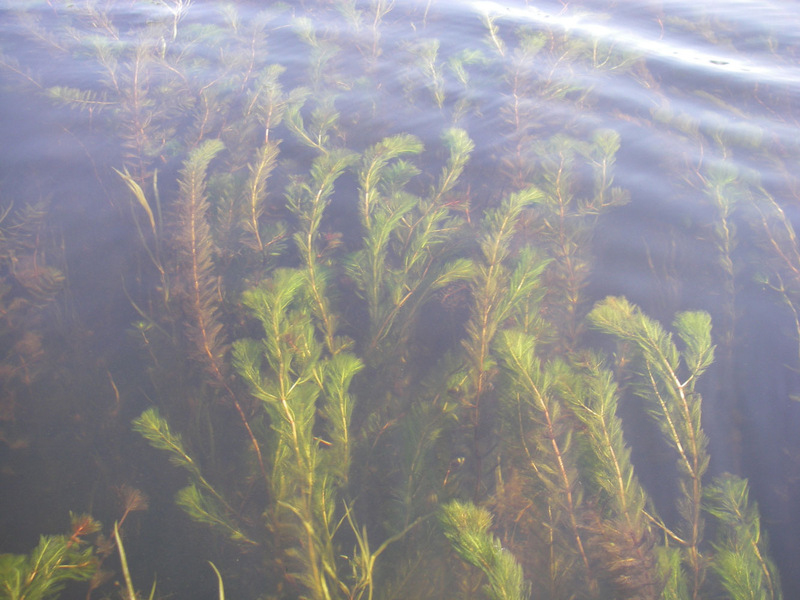 Variable-leaf milfoil (Myriophyllum heterophyllum) is even more growth and spread aggressive than EWM. 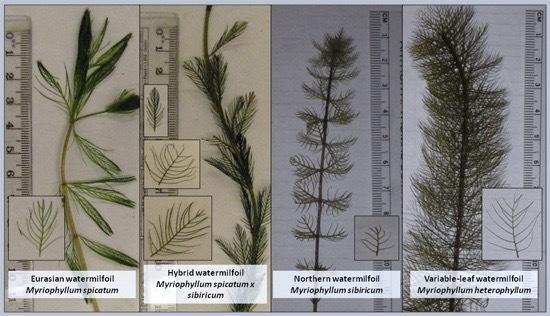 Certain Milfoils are also able to hybridize with other, closely related, Milfoil species. 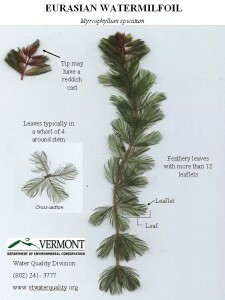 The plant primarily invades aquatic ecosystems in North America via plant fragment transport from infested lakes to uninfested water bodies by watercraft, boat trailers, bilges, live wells, bait buckets, or related recreational equipment, where the plant fragments can stay alive for weeks if kept moist. In fact, any equipment used on or in the water can collect and spread AIS. EWM is commonly found in shallow bays and along the shoreline. The submersed plants typically grow in water as deep as 20 feet and has a theoretical depth maximum of 33 feet in exceptionally clear water. Eurasian watermilfoil is an extremely hardy and adaptable plant, able to tolerate and even thrive in a variety of environmental conditions and is extremely difﬁcult to control after it has been introduced to a waterbody due to its effective means of spreading through stem fragmentation and root stolons. Its early seasonal growth and spread out-competes and displaces the existing beneﬁcial native aquatic plant population for light and sediment nutrients. 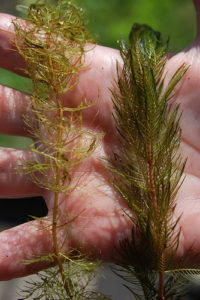 Milfoil roots grow readily in various substrates. Stems emerge from the root crowns each year to rapidly grow to form dense beds. The number of stems per plant increases as the plant ages. The stems stretch toward the surface and then branch profusely to form thick ﬂoating canopies that shade out native vegetation, interfere with recreation and provide a perfect breeding habitat for mosquito larvae. Local spread is vigorous in mid summer. The colony expands by lateral root stolons to form new plants and the dispersal of self-generated fragments. By mid to late summer ﬂowering spikes typically emerge from the water but not all Milfoil colonies produce ﬂowers. The seeds are not considered important to its propagation. Most regeneration and dispersal of Eurasian watermilfoil within lakes occurs primarily by the lateral stolon growth and secondarily by fragmentation. During the fall, some plants die back to the root crowns. The decomposition of dying plant mass negatively increases the phosphorous and nitrogen in the water and decreases the dissolved oxygen necessary to support the ecosystem. Phosphorous is the nutrient that poses the greatest threat to pristine water. 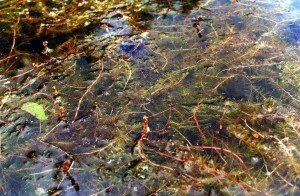 Some Milfoil plants can adapt to surviving under the winter ice intact. In the spring, as the water begins to warm, the vigorous growth cycle and spread begins again. Achieving control is expensive and takes a number of years, requiring a sustained concerted effort on the part of the local government and lake group. EWM stems automatically separate from the parent plant and disperse into the water. The abscising stem fragments often develop roots at the nodes before separation and are capable of forming a completely new plant. The fragments break off, sink and root into the bottom or can remain buoyant and drift in the current transported over long distances to eventually settle and establish new colonies. Fragments not only survive but increase in length and biomass while suspended in the water column for long periods of time. The fragments facilitate stored carbohydrates as a reserve for overwintering or regrowth after dormant periods or plant damage. As Milfoil stems elongate toward the surface, they twist, become weakened and brittle and are easily subject to breakage resulting in more fragments. Fragments are also produced by water turbulence from wind and wave action as well as boating disturbance and other human recreational activities. 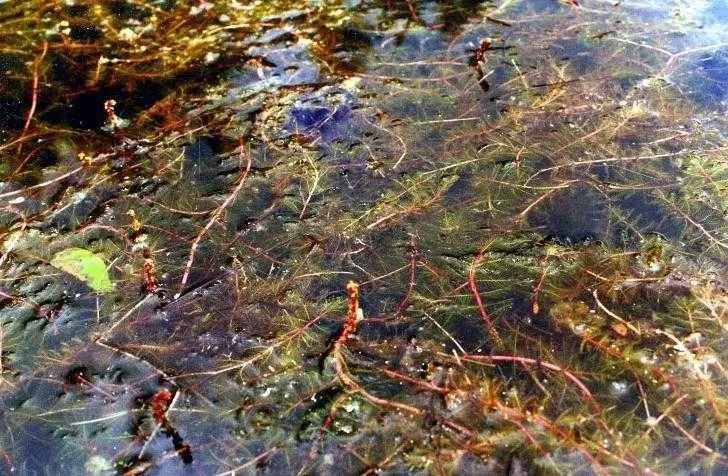 Science has shown if you are able to reduce the number of fragments being produced by reducing the biomass than you can reduce and even stop the spread of Milfoil. 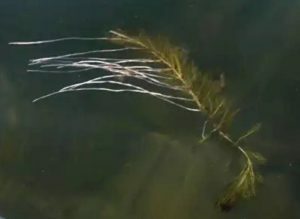 Due to the insidious nature of this highly invasive and aggressive species, just one small piece of Milfoil is capable of starting a new population in a different body of water. This is why Milfoil can be so easily transported from lake to lake when attached on any type of watercraft, trailer or related equipment. Any equipment used on or in the water can collect and spread AIS. Left uncontrolled, EWM can hasten eutrophication. This video, although made in Michigan, is applicable to Vermont and contains valuable information. EWM is recognized primarily by its whorls of four feather-like leaves around the stems. Each leaf is finely divided into paired leaflets, typically 12 to 21 pairs per leaf. Note the EWM leaves are arranged in a whorl attached around the stem. 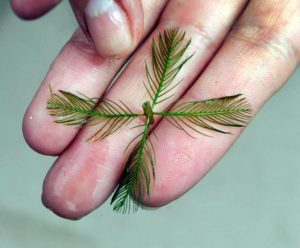 The leaf of the native Northern watermilfoil is more conical in shape (like a pine tree) where the EWM has more of a blunt tip (as if snipped off with scissors) and more leaflets lending a feather-like appearance. Each individual stem branches several times as it nears the water surface, creating a dense floating mat over the surface of the lake. The tops of the stems and leaves of milfoil plants, including the small flower spikes rising above the surface, often turn reddish in color. One of the most important steps you can take to help stop the spread of aquatic invasive species is to become educated about the subject and help educate other lake-users as well. Learn to identify aquatic invasive species. Know which water bodies are infested. Review identification and distribution information on this website. Get involved in local programs that help to protect our waters. Public participation is essential to the success of AIS spread prevention efforts. Join our membership! Annual dues are only $35.00 per household. Membership is your personal statement that you care about supporting the Association’s mission to protect and preserve Shadow Lake and the surrounding watershed for the mutual benefit of all. 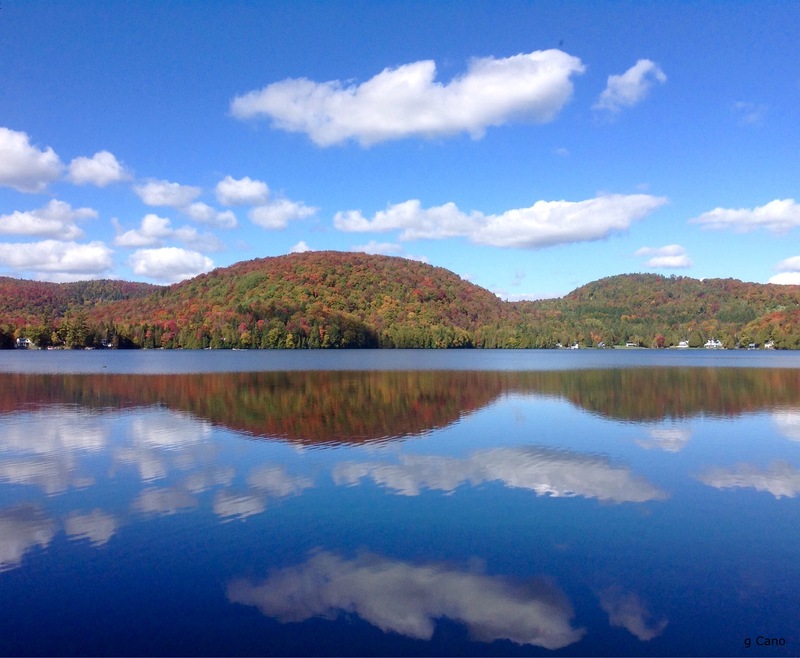 Protecting Shadow Lake from AIS helps in turn to protect all Vermont waterbodies. Our Boat Wash is our lake’s first line of defense against AIS! Please consider becoming a ‘volunteer’ Boat Wash Greeter for a few hours during those critical times that can not be covered by staff. Contact any of our Directors who will be happy to assist you with the necessary training and orientation. You can also donate to our Boat Wash program via this website or contribute in person at our Boat Wash Station located at the State fishing access. Get involved! Learn to recognize aquatic invasive species. Participate in the Vermont Invasive Patrollers (VIPs) program see our page or simply volunteer on your own to help search for EWM and other non-native invasive species in the lake from your kayaks or canoes and even during your swim. If you like, you can ‘adopt a section of shoreline’ to regularly watch over. Simply keep a log or mark your calendar with your time spent searching and drop off your total hours at the boat wash. Remember, the time you spend volunteering counts toward our eligibility for grant funding to continue our essential boat wash program! If you see any unusual or suspicious aquatic plants growing, take note of the exact location (a landmark, certain shoreline area or camp property, depth of water, etc.) and immediately report the finding by contacting any Association Board of Director. Directors list It is very important to not attempt to pull up a suspect plant. Someone with the appropriate expertise will rapidly respond to verify identification. Seriously avoid all recreation in AIS infested areas and significantly reduce your boating speed to No Wake (5 mph) when travelling near any orange buoys installed to mark AIS infestation sites. Any disturbance near these sites; wave action, a turning propeller, paddling, swimming and water sports, fishing activities, etc. 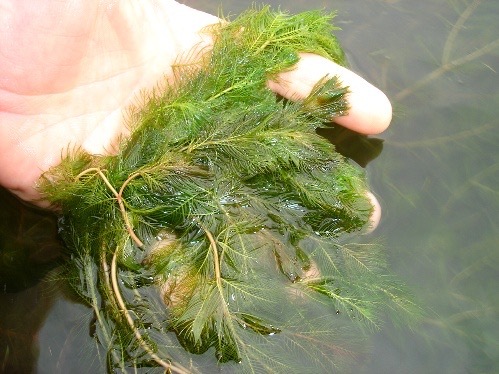 can all easily cause fragments of the brittle Milfoil plants to break off, spread and grow in new areas of the lake! Awareness is not enough! As active users of our water resources, it is important for citizens to participate in our governmental processes to develop and implement legislative solutions that affect our water resources. Check out this web page for easy ways to participate in public policy processes to protect our waters. Programs aimed at preventing the spread or introduction of invasive species into Vermont are the best and least costly means of protection available. 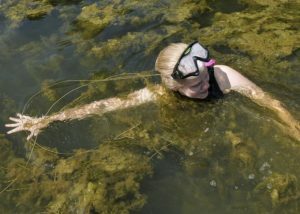 The Shadow Lake Association’s Milfoil Committee’s early detection efforts includes lake mapping and conducting weekly underwater inspections of the shoreline to monitor for the presence of EWM and other aquatic invasives throughout the summer season. We typically conduct two, back to back, lake-wide surveys, June through September, with our team of boat surface support to assist our professional divers and volunteer trained snorkelers. Our Boat Wash program is another example of a working method to help prevent aquatic invasive species from infesting this lake. You can inspect the shoreline for Milfoil, etc. from your kayaks or canoes and even during your swim. The time you spend counts toward our total volunteer hours for grant qualifications. Simply keep a log with dates and times spent volunteering and then drop off the logs at the boat wash. The hours will be tallied for the whole Association’s group effort for grant funding eligibility.